Exploring the man behind the “Mauve Measles” epidemic of 1862; a short foray into the woods, with Tonia; and fiber play, with art yarn spinner, Jacey Boggs. Thanks to my guest this week, Jacey Boggs, art yarn spinner (and sometime podcaster) at Insubordiknit. Jacey is teaching me how to play with yarn, and she can teach you too. Check out her new dvd, Sit and Spin. The Wordy Shipmates, by Sarah Vowell, is my Audible book this week. Highly recommended. Click that big green ad to the right, and get a free audio book with your trial membership. You can read all about William Perkin and is discoveries in Mauve: How One Man Invented a Colour that Changed the World, by Simon Garfield, learn more than you ever thought possible about those early days of applied chemistry, in Dye-Makers of Great Britain, 1856-1976: A History of Chemists, Companies, Products and Changes, by Maurice Fox, and follow one writer’s journey through color in Color: A Natural History of the Palette, by Victoria Finlay. Finally, here is the poem written by Gary Waller, and sent in by Suzanne. You can download Sean’s excellent six track EP for FREE, just by clicking his name, and signing up for his mailing list. There isn’t a duff track in the mix. Highly recommended. Jus finished listening to this episode, and thank you. I think I’m going to look up Jacey’s DVD, or at least get my wheel out and SPIN! While listening, I cast on a Something in Debbie Bliss Cashmerino Astrakhan. Don’t know what it’s going to be yet, it’ll take its own direction. For now I’m just enjoying the process. Brenda, I was so excited to have a new episode today–very motivating for my afternoon hike. In the past several episodes it feels like you’ve found a renewed joy in podcasting, and it’s a joy to hear. Also, I like the Audible thing. Seems like a win-win. I have been listening to your podcasts since just after you began- I think 3 years ago? I love listening to every episode. I find them so inspiring, especially this last one about playing. I get too wrapped up in what something is “suppose to” look like before I even start that it keeps me from getting started!! I’m an oil and watercolor painter, spinner, dyer and knitter and just today like 2 hours ago I tried needle felting for the first time!!! I’m in love. After my lunch I’m going to go spin up the rainbow locks I just bought yesterday at the local fiber gallery we have here in Portland, Maine. Right now I’m studying to be an art teacher, have been to Ireland 3 times, have adored sheep since as long as I can remember, and am 30. Just a few pieces about me. Thanks for being here! I haven’t even listened to the episode, but how crazy is it that I’m reading The Wordy Shipmates right now. At least I have the excuse that I’m a pastor at a Presbyterian church, but I am amazed, nay, astounded that others in not-so-religious profession find it so interesting. Just finished listening to the 75th episode! OMG! I adore your podcasts and listen and re-listen to the all the time,I love the sound of your voice! you should get PAID BIG BUCKS! for that voice! Thank You for all the hard work you put into the show it is fab. I just took my first spinning class yesterday! I am ready to spin! now I need money for fiber! I’m off to download Sarah’s book and order Jacey’s dvd. Thanks again for another fantastic episode! the story of mauve was fascinating! thank you! I love listening to your voice Brenda, and this episode really touched something in my mind and sparked it off. Inspired by this podcast I cast on with the one and only ball of Sirdar Country Style DK in Bilberry I’ve been able to get my hands on – the most beautiful shade of purple in the world – the yarn I’d been saving for THAT special project. You know the one. The project the yarn was _made_ for. Well, I’ve had a project in my ravelry queue for some time (Charm Mitts by Sarah Bradberry of knitting-and.com) which I previously couldn’t justify as fitting in my ethos of practicality but the call to experiment, to not save yarn, and to see what you can make made me see it as an art project. Thankyou Brenda for reminding me that creativity needs us to play. P.P.S. please share the sock pattern. I desperatly want to knit them! Hi Brenda, Ive just been listening to your podcast – it´s wonderful. I just recently found you and now Ive downloaded all your programs. I have been ill the past year, suffering from depression. When I started to get my spirits up a bit and began knitting again I realized I knitted with a whole different feeling. Now I knit for my sake – not because I want to be a “clever girl”. I´ts calming, joyful and very comforting. I´m starting my journey back to work next week and am a bit nervous about it. I look forward to sit down at home listening to you and knit. Please visit my blogs (you can now translate them into English) One is about my BOOKS http://www.boktokig-bokmal.blogspot.com. and one is an invitation to an online KAL. http://www.stick-litt-kal.blogspot.com. I just keep hearing you say “don’t be afraid to be wrong”. What an amazingly simple, yet powerful and provocative idea. Now that’s a goal worth striving for. On a side note, I loved virtually coming along on your tramp through the woods. It’s mighty snowy and more importantly icy here in New England, so such fun still seems a long way off. I just can’t imagine these horrifying brambles though, and hope you’ll post a photo some time. Brenda, I know I am dating myself a bit here, but when I heard “Falling for You” during the podcast, I kept hearing Dr. Hook “Sharing the Night Together” (oh-ohhh, yeah-eahhh). Now I need to download his EP to see is channeling Dr. Hook only, or the whole Medicine Show. Tee-Hee! I just wanted to say “Thank you!” I am so glad to learn that I am not the only person who feels like they are wasting yarn (or stickers or beads or paper or….) when I make something, never mind trying something new. Can you say “Hoarding complex”? Thanks for putting it out there. You told me of your latest podcast upload via twitter! I’m speednet, and was thrilled that now I’ll hopefully listen more regularly. It was also a comfort to know that others take more than a week or two to knit a pair of socks. I’m excited for you that your pair is complete and it makes my multi-month socks projects seem not such a failure. I’m also excited to see the vine design as I’m seeking something that will remind of Formula 1 courses for the next pair of socks for my SO. I had to chuckle during day two of no heat in the house … I put a sweater on and could hear you reminding me, that is it’s purpose. Since you mention re-working your website I wanted to mention, I frequently find myself wishing you had all the podcasts you keep mentioning all linked in one place. Is that possible? Or if someone else has already compiled links to good knitting podcasts then I could just go there. And another thing! After listening to episode 12 I really wanted to be able to buy a copy of the acoustic daydreams instrumental. I don’t suppose it’s available anywhere on it’s own? Becky, I used to keep a running list of all the knitting/fiber related podcasts, but there are just too many of them now to manage. There is a wiki list on Ravelry that you can access if you have an account. There are hundreds now. It’s hard to believe that when I started there were only two! Cast On, and the first podcast ever, Knitcast, hosted by Marie Irshad. Zach’s tune really should be available for sale, but it’s not. I’ve put that on the To-Do list, and will let you know when it’s available. His motorcycle is always in need of some part or other, so I’m sure he’d be glad of some extra cash! I’ll be sure to tell him you asked. Hey Brenda?? Are you reading my mind or WHAT? I totally feel like I’m wasting fiber if I’m just “playing” and now that I think about it, you are so right to say that I’m wasting the fiber by not spinning it. Long time listener – first time making a comment (YIKES … I’m writing to podcast “royalty”). Your podcast always transcend the “fiber” scope and speaks directly to my heart, often leaving an echoing phrase or thought with me (such as, “start as you mean to go on”) and this one was no different. THANK YOU !!!! PS Quite peculiar is the fact that I work in the intellectual property field as a trademark paralegal – and knitting is my escape from it – so imagine my astonishment when I heard you discussing Sir William Henry Perkin and his patent endeavors. So interesting! This episode was really fun, I enjoyed walking through the Welsh woods you. Thank you so much for the podcast. I have especially enjoyed the theme of alchemy. Just curious — does birch syrup get boiled down the same way maple does? Forty gallon of sap need to be boiled down to make one gallon of maple syrup. Maybe the birch sap is watery because it needs to be boiled down before it is transformed into a usable syrup? Or is the wine made from the raw sap straight from the tree? We think the birch liquid is still watery because the sap isn’t really rising yet. Our research would seem to indicate March is month for tapping birch, though of course it depends on the weather. F.Marian McNeil’s, The Scots Kitchen, gives this recipe for birch wine: To every gallon of the juice from the birch tree, three pounds of sugar, one pound of raisins, half an ounce of crude tartar, and one ounce of almonds are allowed; the juice, sugar and raisins are to be boiled twenty minutes and then put into a tub, together with the tartar; and when it has fermented some days, it is to be strained and put into the cask, and also the almonds, which must be tied in a muslin bag. The fermentation having ceased, the almonds are to be withdrawn, and the cask bunged up, to stand for about five months, when it may be fined and bottled. Keep in a cool cellar. Set the bottles upright or they will fly. You know, a great way to give yourself permission to play with your fiber is to have a stash-swap. I swapped a huge box of fabric for an even huger box of hand-dyed batts, roving, and some awesome spindles. It’s nice to know that someone is appreciating all the fabric that I enjoyed collecting but never had a plan for…I can imagine her excitement as she opened her package and only hope it matched my kid-at-Christmas-morning feeling as I discovered all the goodies in mine. Since some of the fibers that I received are not in the colors I would normally choose for myself, I’m not as attached to them in the visceral way that the most gorgeous shade of green or purple would call to me, hence I’m not afraid to try some new ways of spinning with them. It’s a welcome change to not have an agenda for a particular fiber…just to spin it & let it turn into whatever it wants to be. I am fairly new to your podcasts, but I wanted to thankyou for your efforts. I am working my way through your archives at the moment and I really enjoy hearing all your knitterly tales. It really is like having a chat about knitting and yarny things to a friend. I tend just to bore people with my yarny tales. I was surprised to hear that you can make dyes out of bracken fiddleheads. In one of my college classes we picked and ate them (anything is yummy with butter.) I had hear that in Canada they sell them frozen. I wonder if they’re the same species in Wales as in the states? You really have your Mojo back!! If there is a Best of Brenda list, then episode 75 must be on the list. It was a fantastical whimsical journal reaching many corners of the craft. What a pleasure that you shared it with us. So glad you keep on cranking out the podcast. Brenda. Thank you for this excellent podcast. You just connect us with so many ideas that help us create our own alchemy. http://nkilkenny.wordpress.com/2009/02/23/schools-please-dont-kill-our-creativity/) on the subject and I linked to one of my favorite TED lectures ever: http://www.ted.com/index.php/talks/tim_brown_on_creativity_and_play.html. In the lecture, the CEO of IDEO, Tim Brown, talks in detail about the importance of play for not only creativity but productivity. Thank you for a great podcast with so much that interests me. Last year I planted 25 silver birch trees to form a spiral shape in the paddock. They have struggled through the 35oC+ summer heat but are hanging in there well mulched with old alpaca fleece and straw!! Perhaps in 20 years they may yield some sap for wine…. How exciting to be able to spin lumps and bumps just whever you want…..very freeing. I’m enjoying the latest episode on my iPod on my way to and from work! Your trek into the woods in search of Silver Birch sap reminds me of helping my grandfather tap maple trees for making syrup as a kid. He passed away a couple years ago, and I always think of him a lot at this time of year when the sap begins to run. No one in my family makes maple syrup anymore, but when I can, I always try to find the darkest, thickest stuff at the local farmer’s market (rather than the watery kind they sell in the supermarket) because that’s the way he made it. I also wanted to mention I’m experimenting with another kind of alchemy – sourdough bread. Holy lord. This is one of those things that seems to have some kind of mythology around it – there seem to be a million different ways to do it found online, and so far I’m finding it takes a lot of experimentation to get it right. While I’ve now managed to get a lively starter going, making a loaf of bread still eludes me. By the way, the azaleas are blooming in Texas and it’s 74 balmy degrees. I love your podcast. I’ve been listening for a long time and you feel like an old friend. Just wanted to let you know that I listened to this episode twice in a row. It was incredibly inspiring. I love how you make me think. Thank you for all of the wonderful work that you do. My fiber life would not be the same without you. Just getting to the end of the episode and you thanked your musical guests. And I realize I know one of them. A friend of mine introduced me to Katy Pfaffle a few years ago. She plays gigs mostly in Manhattan and I haven’t kept up with her music but she sang at another good friend’s wedding last fall. I found the silver birch experiment fascinating. I’m inspired to give it a go myself. I wonder if the position of the moon has anything to do with the sap rising. For example,does the sap rise more so on the waxing of the moon?? Hmmmm. 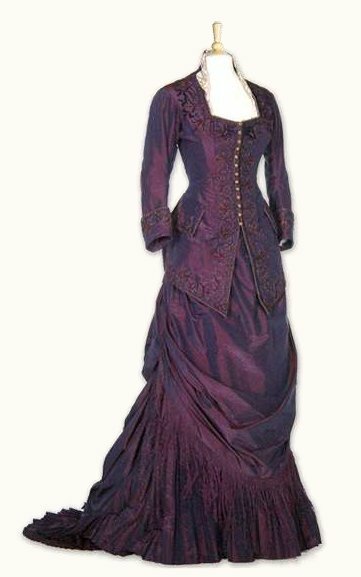 Loved the history of the colour purple/mauve. Thanks for the podcast. Brenda, I was listening to your podcast today on an unusually warm day while I was pruning back some of my crepe myrtles and hibiscus and I just fell in love with your essay on William Perkin. Delightful! As a knitter and a science teacher I was thrilled to have two of my favorite things combined into a wonderful piece of audio. Thank you so much for that wonderful interlude. It made me stop my pruning for a moment and listen to you and the birds sing on a lovely Tennessee day. Science and knitting. They just go together. Hi Brenda! Just getting to catching up on 70-75… AWESOME! Thanks again for being an inspiration! oh, and um, the rest of the podcast is great too! ;~) thanks for all you do to add so much richness to my knitting life. Just wanted to let you know how very much I enjoy your podcast. I can’t seem to find the information on finding your music play list. Thanks for the podcast – I especially enjoyed the trek in the woods with Tonya. As a fairly new listener, I’ve been trying to catch up on back issues of your podcast too, and it has been a real pleasure. I think your choice of Audible for advertising is a great one. I don’t find it intrusive – it’s more like just chatting about books, and I hope it’s generating some good revenue for you. I loved coming along on your little adventure in the woods. Tanya’s accent is wonderful. Just when I think that I have heard the best Cast on episode, you out-do yourself. Hmm. If you’re trying to tap birch sap and you need slim, sharp wooden sticks of a certain diameter, wherever could you find those?